Update March 20, 2010: CDG Luggage Storage services are still in operation. There have been rumours that luggage storage at CDG Terminal 1 and Terminal 2 have been closed due to security concerns, but this is patently false. I’ve spoken directly with Aeroports de Paris representatives who confirm that Bagages du Monde is operating normally. I’ve included their correspondence at the end of this article for your reference. Baggage storage at CDG Terminal 2F – Gate 4 Arrivals level (one level down from Departures, ground level). There is no baggage storage at the CDG RER/TGV Train station itself. 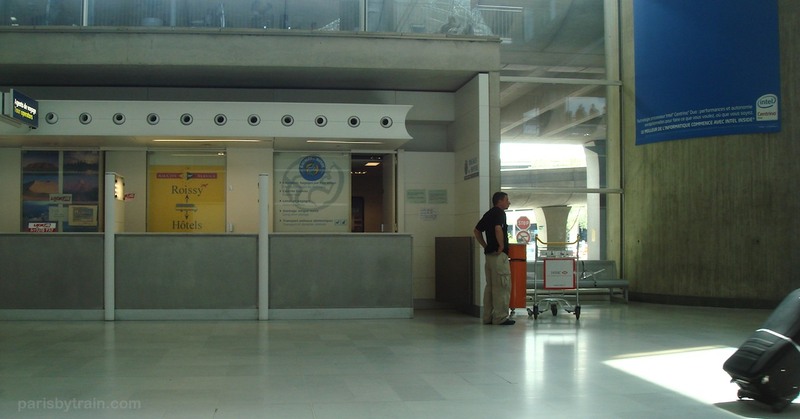 Below is a photo of the luggage storage service counter at Paris Airport Charles de Gaulle (Terminal 2F Arrivals level, third kiosk on the right). The name of the baggage storage company is Bagages du Monde. Please keep in mind that the baggage storage company at CDG is not open 24 hours a day. Be sure to check that it will be manned when you need to collect your luggage. More questions about luggage storage in other stations? Click here for a new ParisByTrain article. Je vous confirme que les comptoirs Bagages du Monde dans les terminaux 1, 2A et 2F sont toujours en ouverts.